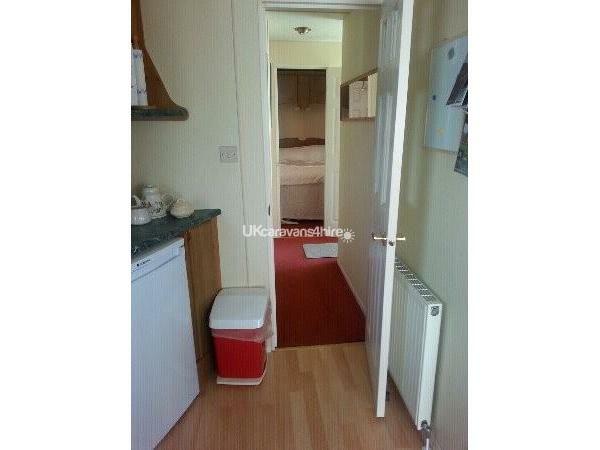 Additional Info: Kensington 29 is new to hire in 2016, and is on a a spacious plot with gas mains, not bottled gas. There is parking for two cars on her parking bay with a paved patio area from the bay to the living room door and the hall door and a grassed decking, which faces the sun during the day. 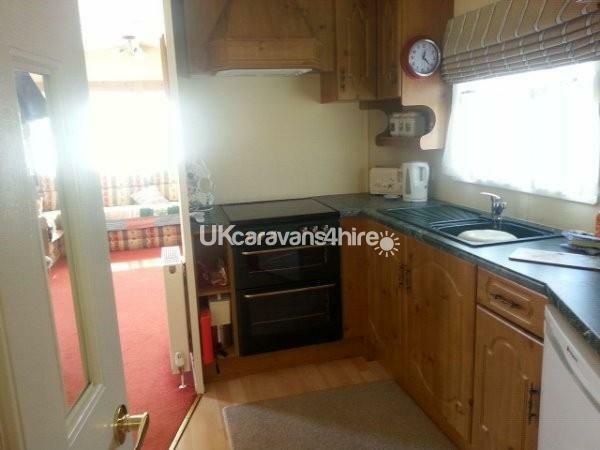 She is an exceptionally clean caravan and a pleasure to stay in, I love to stay myself. 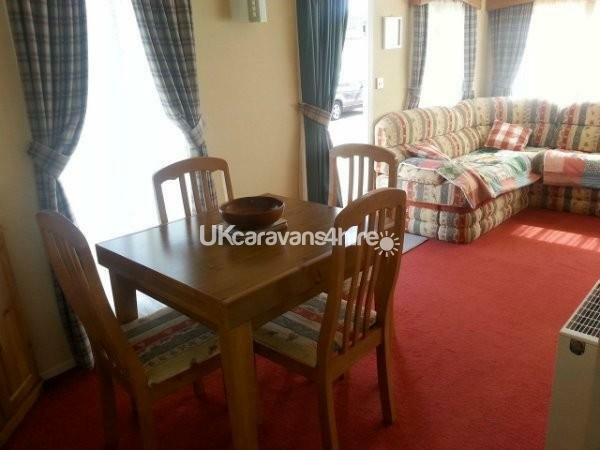 Her interior includes a comfortable sitting room with pull out double bed, television and DVD player, leading to spacious dining area with table which can extend for six. The kitchen area is open plan through to the dining area, with all the utensils and electrical appliances you will need for your holiday, even tea towels and cleaning products! The kitchen door leads to a central hall way leading to the shower room with a lovely hot shower, toilet and hand basin. The 2nd bedroom has two single beds, one which can be pushed back to wall for more space for one person if required, there is storage space above and under beds and one wardrobe. Henry hoover is in the wardrobe. The 1st bedroom has an en suite toilet and hand basin, She has extensive drawers below two dressing tables either side of bed, a larger than average wardrobe, and storage above and beneath a double bed. There are seven chairs and a patio table outside on a grassed and gated decking, with a 3 arm dryer for clothes if required in the boiler area. 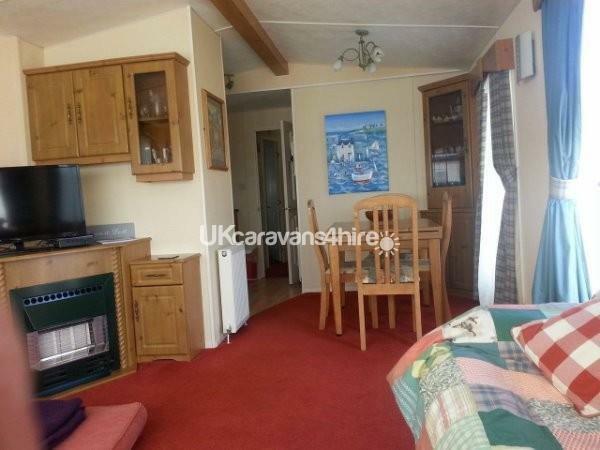 There is a tall pile of tourist information inside the caravan for either relaxing days out, or fun packed family days around Hunstanton and the Norfolk Coast. I know you will have a great holiday in Kensington 29, I live here now, so I do miss staying in her. Welcome to Hunstanton, the only coast line on the East of England where one can see the beautiful sunsets over the sea. A £50 deposit is required asap - after receiving paperwork, and the balance is due 8 weeks before the date of arrival. Thank you. My mobile connection is a little slow with 12" walls in my new home, and being close to the sea; 07745294949. For the moment best to leave messages on my BT landline, and I will either catch your call, or get back to you asap. 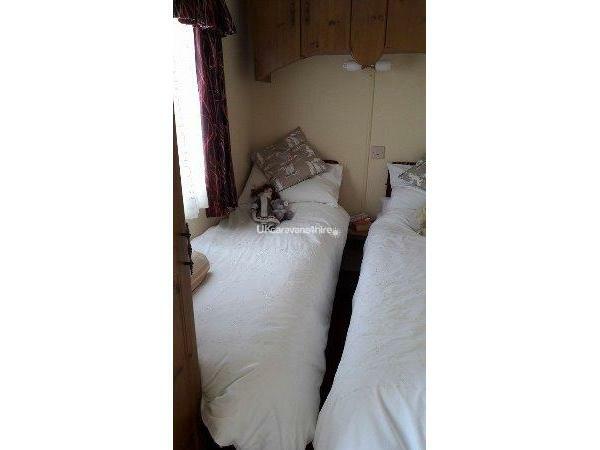 Our new addition in 2016 is a dog friendly, 2 bedroom caravan situated on Kensington close to the duck ponds. Kensington 29 can accommodate up to 6 guests and benefits from central heating, gas fire and cooker - all on gas mains like at home, and double glazing throughout. 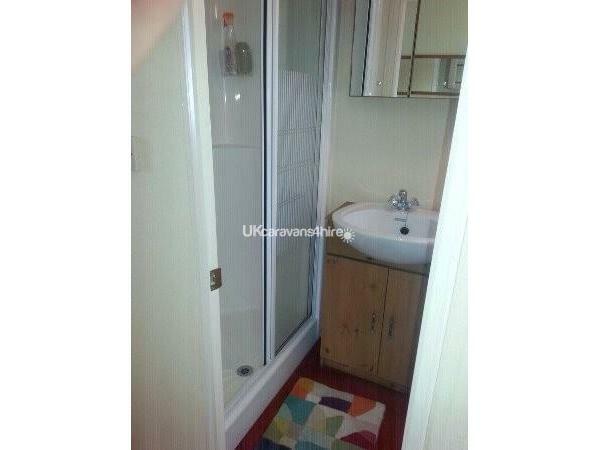 She is on a spacious plot on Kensington, with a parking bay that can accommodate two cars. She also has a paved patio area from the parking bay to front door, and steps to grassed decking and second hall door - with a latch gate on decking. 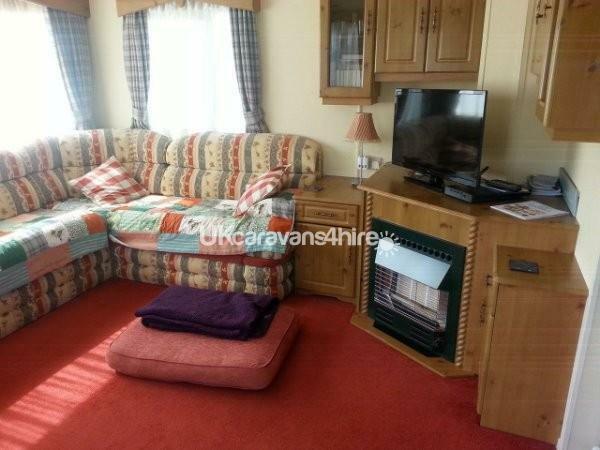 She is an exceptionally clean caravan and a pleasure to stay in, a real holiday home from home. 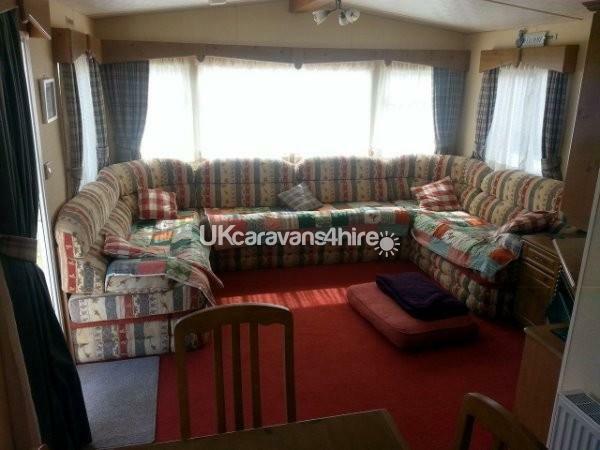 Her interior includes a comfortable sitting room with pull out double bed, television and DVD player, leading to the dining area with an extending dining table. There is a doggie cushion and doggie blanket if required left under double bed, which may be taken into the living room. And a large doggie water bowl on the decking. All curtains are interlined for early and late holidays, with radiators in every room. She is on advert for 11 months of the year and is as warm as a house in the colder months, and for Christmas and New Year breaks. The kitchen area is open plan through to the dining area, with all the kitchen utensils and electrical appliances you will need for your holiday, Iron, tea towels and cleaning products under the sink! The bigger oven makes good sponges for the kids, and Mum and Dad. 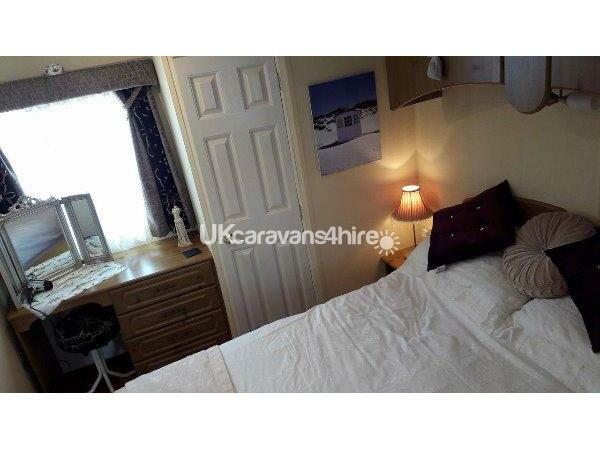 The 2nd bedroom has two single beds, one which can be pushed back to wall for more space for one person if required, there is storage space above and under beds and one wardrobe holding the Henry hoover with dog brush. 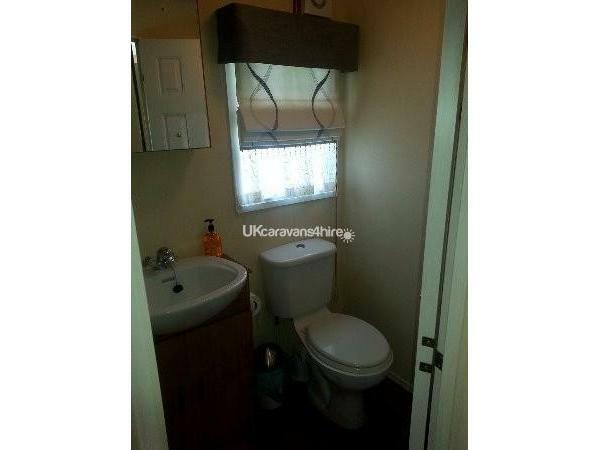 The 1st bedroom has an en~suite toilet and hand basin. 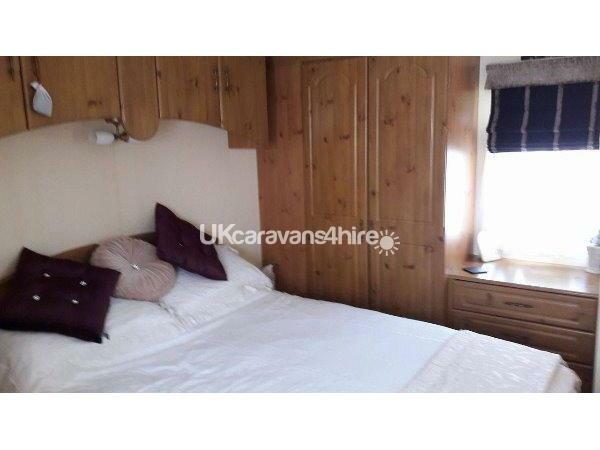 There is extensive drawer space below two dressing tables either side of bed, a larger than average treble wardrobe with ironing board inside, and storage above and beneath the double bed. I had a new double mattress for my guests delivered in March 2016. All beds have regularly washed mattress and pillow protectors. Outside, there are seven chairs and a patio table on a grassed and gated decking with a latched gate, and a large doggie water bowl on the decking. There is a 3 arm dryer for clothes if required in the boiler cupboard. You will be pleasantly surprized with information inside the caravan informing you of the places to go in and around Hunstanton. Information includes local pharmacy opening times, local doctor's contact no., and Veterinary practice; hopefully not needed. Welcome to my new addition for hire on the Manor Park this year. Additional Info: Indoor swimming pool, Amusements, children's club, entertainment and a play area. My Sister and I had a wonderful time in this particular holiday home. It was so comfortable and cosy in the chill evenings. Tommy was very happy watching the ducks on the decking, or just being nosey people watching. Everything you could think of was there for our convenience. Such a lovely lady, a pleasure to sit and chat. Thank you. The caravan was spotless and very spacious we had a lovely time and Bluey our cockerpoo Dog loved it out on the decking,also thanks for letting us in early on the Saturday,we hope to be back this year soon.